So said Rick Edwards on ITV’s #LeadersLive debate during his introduction to an online only Q&A programme with our political leaders targeted at the under 30s age group, which started yesterday. First up was Nigel Farage. You can find the video below. Today’s Autumn Statement proved the point young people need to engage with politics or the politicians will not listen to them. Politicians only listen to people who vote: it’s as simple as that. The headline announcement was the reform of stamp duty. This is good – in the short term (more on that in a moment) – for house-buyers of today but a redundant announcement for the hundreds of thousands of young people who can’t even cobble a deposit together to get a mortgage never mind work out if they can afford the stamp duty on top. But by the time these young people – if they ever can – are able to pull the required deposit together the stamp duty reform will have helped to increase house prices as sellers will now accept bids above the old stamp duty thresholds because they will know buyers will have more money to play with because the artificial cliff-edge barrier which saw stamp duty rise by thousands of pounds (e.g. from 1% to 3 % when £250,000 was passed, as in the old system) will no longer be there. Nearly all the announcements were aimed at middle income earners with families and older people: the two groups who vote the most. You always hear politicians talk about “hard working families” or pensioners who’ve “worked hard all their lives”. You will never hear George Osborne talk about the childless singletons who pay huge amounts of income tax and VAT but very rarely take from the public purse (they even have to pay for their bin collections – around £100 a month considering they don’t use any of the other council services). The NHS will receive another splurge of tax (£2bn a year for the foreseeable future) but in my view this is just throwing good money after bad. The NHS is a highly inefficient organisation that is ripped off by drugs manufacturers because there is no competition to drive prices down with wasteful spending by doctors, nurses and managers from top to bottom, such as spending £80 million on paracetamol prescriptions which cost as little as 19p in supermarkets. This is allowed because there is no incentive to keep control of costs when the organisation is so sacred and revered by all political parties, even including UKIP! The taxpayer will just keep footing the bill, won’t they? Weirdly, the general view amongst young people is the NHS is great, although I did hear a young man in his early 20s on the train a few months ago complaining to his mate about the woeful NHS care he had experienced and how he didn’t understand why people criticised an insurance based system like in the US – as the young man put it: “at least the care in the US is better and it’s not as if the NHS is “free” anyway, it’s paid out of of National Insurance.” I could not have put it better myself. Back to our young people: what was the policy in today’s Autumn Statement aimed at those below 30? Oh yes, a personal debt. The chancellor announced Government-backed student loans of up to £10,000 are to be made available for postgraduates! If you’re under 30, you’ve got to do politics and VOTE or politics will just keep doing you! Categories: Politics | Tags: Autumn Statement, George Osborne, NHS, NHS waste, Nigel Farage, Rick Edwards, Stamp Duty, tax, young people | Permalink. This is a true story. The Care Quality Commission (the NHS inspector) visited 1000 doctors surgeries and in one case found the clinic so dirty the treatment rooms were infested with maggots. At other surgeries, consultation rooms did not have doors, providing no privacy to patients. The usual complaint of not even being able to get an appointment was brought into stark focus when inspectors found patients queuing for hours outside their surgery in Birmingham to book an appointment – some were so prepared for this horrendous “service” they brought their own stool to sit on in the street during the wait to be seen. The CQC also found some GPs were just not up to the job with some not even able to use basic life saving equipment. Inspectors found that in another West Midlands surgery two doctors had each referred the other to the General Medical Council on grounds of incompetence. This is a report on the front door to an organisation that costs the British taxpayer £120 billion a year! It comes as no surprise. We’ve all got horror stories to tell about the experience we have had at our GP surgery. I remember a time when you couldn’t get an afternoon appointment if you called in the morning and instead you had to call at 1pm to make the afternoon appointment. This we now know was due to a Labour Government target whereby patients had to receive an appointment within 48 hours. Patients, therefore, were barred from booking an appointment greater than 48 hours in advance so GP surgeries could meet the Government target. My GP surgery in Ipswich went one step further and refused even to book an afternoon appointment during the morning of the same day. This was also the case for mother Diane Church who famously tackled Tony Blair on the BBC’s Question Time during the 2005 General Election. Blair said he found the interpretation of the target “absurd” and ordered the practice to stop. But the contempt for patients by doctors continued. They colluded with Labour to take a massive pay rise for doing less work – i.e. refusing to undertake out-of-hours care – leading to patients being left in pain during the night and in one case a man was killed by a foreign doctor without an adequate grasp of English. As I’ve said before, the NHS is a flawed institution, which harms rather than helps patients. It, frankly, unnecessarily kills patients by the thousands, as we saw at Stafford Hospital. The NHS removes people’s dignity in their old age as we have seen by the way nurses treat our elderly relatives, left to die to thirst in their own faeces. And now it has been proven GPs hold the same contempt. Enough is enough. Billions and billions of pounds are being spent on an organisation not fit for purpose. It is a political organisation not a health service and needs to be broken up and privatised. Only then will we stop the pain and suffering it inflicts daily when it is meant to be doing the opposite. A classic case of the political interference is this quote on the CQC GP surgery inspections by the Tory Health Secretary, Jeremy Hunt: “Patients have a right to expect the best care from their GP practice. That’s why we have introduced this new, tougher system of inspection which will root out poor standards and celebrate the best.” (my emphasis). Why should a Secretary of State be even remotely concerned with “celebrating the best”? A doctor giving a good service to a patient shouldn’t be celebrated. In other parts of the world, it is demanded by default a doctor is good – if they aren’t, they face prosecution. Their very handsome wage is there to say thank you. This encapsulates the political interference which is THE problem. This faux praise – along the lines of how “wonderful” our nurses are – may garner a few votes but it is costing thousands of lives. I was speaking to a colleague in Belgium the other day and she was recounting her experience of dealing with doctors to treat her cancer. She was able to pick and choose her consultant, her hospital, everything about her care. In the UK, we’d be lucky to even be referred to a specialist by our GP before dropping dead, as has been proven in recent days. The Envy of the World? What a sick joke. Categories: NHS, Politics | Tags: Care Quality Commission, GPs, Jeremy Hunt, NHS | Permalink. Just when you thought it couldn’t get any worse – it does. And this time, the police have been, rightly, called in. Medics and managers at Colchester General Hospital in Essex doctored patient records about when they received cancer treatment to meet arbitrary Whitehall government targets. Patients were left waiting longer than the government target for treatment but the hospital altered their record to say they had been seen by a specialist earlier than they had been. People may have died as a result of delayed treatment. Inspectors found that out of 61 records viewed, 22 had been altered. The Care Quality Commission found the deliberate altering of records showed people had been “placed at risk of receiving care that was unsafe or not effective, due to delays in receiving appointments or treatment”. Professor Sir Mike Richards, the newly appointed chief inspector of hospitals, has moved to recommend the hospital should be put into special measures whilst Essex Police investigate if doctors, nurses and managers have committed a criminal offence. If you caused harm to someone in the street, you’d be in the back of police van before you could say “I want to see my brief” but if the “wonderful” NHS kills patients, which it did in the thousands at Stafford Hospital between 2005-2008, it’s a different matter. We even have the man who was in charge of the NHS killing machine when it was in full flow at Stafford, Labour MP Andy Burnham, still denying responsibility and his current job is, sickeningly, Shadow Health Secretary. Frankly, when news broke yesterday about Colchester Hospital fiddling the cancer treatment waiting times, I wasn’t surprised. When government targets were not imposed prior to 1997 it didn’t help; when the Labour Party imposed hundreds of targets – dropped from Whitehall – it hasn’t helped either. In fact having top-down targets from Westminster seems to have unleashed the inner evil (and I use that word deliberately) in people. Nurses at Stafford Hospital displayed the behaviour of concentration camp guards rather than caring health professionals, leaving elderly women soiled in their beds and forced to drink water from dirty vases because they were so dehydrated. Oh, let’s recap: has anyone been prosecuted for these barbarous acts? Err, no! The NHS is fundamentally flawed as an organisation. I can’t understand why when we now know State-run coal mining, State-run airlines, State-run telephone companies are not efficient and do not give a good service to customers must we continue to kid ourselves State-run healthcare is any different. Considering the NHS has the ability to kill or keep alive its ‘consumers’, more focus should be placed on providing a healthcare system which uses the most efficient working model. The State has been proven time and time again as useless at running organisations: how more people need to die before we look around the world for a better system of healthcare, such as in the Netherlands? Categories: NHS, Politics | Tags: Andy Burnham, cancer patient records, cancer treatment, Care Quality Commission, Colchester General Hospital, NHS, Prof Sir Mike Richards, Stafford Hospital | Permalink. So are you going into hospital in the UK’s “wonderful” NHS soon? You might wish you were being treated in America. Professor Sir Brian Jarman who pioneered the use of hospital standardised mortality ratios (HSMRs) to measure higher (or lower) than expected death rates last week released previously unpublished data showing horrific death rates in NHS hospitals during 2004. Sir Brian was so shocked he thought his data must be wrong and has spent months having his data scrutinised by other academics to look for a flaw in his methodology. They couldn’t find one. Sir Brian then felt compelled to publish and the alarming results were broadcast by Channel 4 News last week. Sir Brian calculated if you are treated in an NHS hospital you are five times more likely to die from pneumonia and twice as likely to be killed by blood poisoning than if you had the SAME procedure in the United States. Death rates in NHS hospitals in 2004 were also 22.5 per cent higher than six other western countries including Canada and France. Once the figures were adjusted the NHS death rate was 58% higher in England than the average in the best performing of the seven countries. The data of course is nearly 10 years old and death rates in recent years are not yet available. The NHS is clearly not the “envy of the world”, as the Left love to call the bloated state provider of healthcare. Once you push past the grinning politicians who extol our “wonderful” doctors and nurses the experience hundreds of thousands of people have when treated by the NHS is far from wonderful. In thousands of cases, families found the NHS needlessly killed their loved one. So why is the United States far better at keeping people alive when they go into hospital for a routine operation? Professor Sir Brian Jarman believes – rightly in my opinion – that the US has a more transparent health care system that has a culture of flagging up failings so they can be dealt with quickly and subsequently improving the health care service for the patient. In the UK, if a manager or nurse voices a concern about resources on a ward or a drop in safety standards in an operating theatre they can expect to receive the cold shoulder at best, or be sacked (through vexatious performance management procedures) at worse. The culture in the NHS is the same as the rest of the public sector and summed up best by Sharon Shoesmith, who oversaw the children’s services department at Haringey Council that allowed Baby Peter to die, when in response to that tragedy she said: “I don’t do blame“. No one in the NHS is held accountable for mistakes. It’s always the disembodied “system” that is at fault. Managers can’t (of course!) blame individuals despite it being an individual nurse who leaves food out of reach of elderly patients or spends so much time stuck in the nurses pod that they don’t realise an elderly woman is being forced to drink water from a dirty vase to stay alive because she has not been provided a drink by our “wonderful” nurses. It’s not just nurses and doctors at fault. Managers in the NHS are also guilty individuals when it comes to preventing needless deaths. Sir David Nicholson, the outgoing boss of NHS England, was a classic case of who gets rewarded and promoted in the NHS. Sir David presided over the deaths of thousands in his previous job as head of the Mid-Staffordshire NHS trust where 3000 died but he “played the game” and ensured no fuss was made and that Stafford Hospital’s goal to achieve the coveted Foundation status was kept on track by meeting Labour’s Whitehall-imposed targets. So what was Sir David’s reward to adhering to the “I don’t do blame” NHS culture? Why, promotion to chief executive of NHS England of course! For good measure, Sir David even went to Parliament when the Mid-Staffordshire killing field was uncovered and lied misled MPs when he said Gary Walker, former head of United Lincolnshire NHS Trust, had not identified himself as a whistleblower when he raised patient safety concerns to Nicholson in a 2009 letter to him. Is it any wonder NHS patients are almost 60 per cent more likely to die in hospital compared with patients in the country with the best mortality rates? Categories: NHS, Politics | Tags: "wonderful" nurses, Mid Staffordshire NHS Trust, NHS, Professor Sir Brian Jarman, Sir David Nicholson, Stafford Hospital | Permalink. The fight back against the NHS killing machine has begun. Two nurses who were working at Stafford Hospital between 2005 and 2009 when 1,200 patients unnecessarily died have been struck off. The Nursing and Midwifery Council today found Tracey Ann-White and Sharon Turner guilty of falsifying A&E discharge time records (to meet the Labour Government centrally imposed targets). During the Council’s ruling, they also judged Turner had used abusive language towards patients. This is just the tip of the iceberg. Hundreds of doctors and nurses are likely to have committed malpractice, considering 13,000 patients needlessly died during the same time period. Categories: NHS, Politics | Tags: "wonderful" nurses, Labour Party, NHS, Nursing and Midwifery Council, Sharon Turner, Stafford Hospital, struck off, Tracey Ann-White | Permalink. A story at the weekend which was eclipsed by Prof Sir Bob Keogh’s report (to be published later today) into 13,000 unnecessary deaths in 14 NHS Trusts was the Government’s decision to scrap the Liverpool Care Pathway (LCP), dubbed the death plan for its sole aim of killing off patients at the end of their lives to free up NHS hospital beds. The LCP was promoted by doctors and nurses as a programme to give terminally ill patients a dignified death. It was nothing of the sort. NHS Trusts were incentivised with money to put people on the death plan and the more who were killed off through its use the more dosh the NHS Trust got their bloodied hands on. The Department for Health ordered an inquiry into the LCP, it’s practices and the experiences of patients placed on the plan and their relatives. Liberal Democrat health minister, Norman Lamb (who I’ve always had a lot of time for, especially his work on the credit card industry), branded the LCP “a national disgrace”, which is an understatement considering the evidence collected from patients’ relatives. People placed on the LCP were refused water to the extent some were seen desperately sucking at wet sponges. Nurses (yep, those “wonderful” nurses again) involved in the implementation of the death plan were described in the LCP review report as “uncaring, rushed and ignorant” and of using “brutal or callous language” with the word ‘futile’ scrawled in big letters in one patient’s notes who had been placed on the death plan. There were several reports of doctors and nurses passing the end of patients’ beds saying loudly “Oh, is X still with us? Once patients were placed on the LCP, there was no course of appeal. That was it. The only exit was death. Some patients, desperate for water, were heavily sedated to shut them up. Where relatives could, they gave them the water they were crying out for only for nurses to scream at them from across the ward to not given them a drink because they were on the LCP. There were multiple accounts of this behaviour from nurses. The Liverpool Care Pathway (LCP) was basically a doctor’s order to starve a patient to death with even junior doctors in the middle of the night giving the order the patient should die. This is the UK in the 21st Century not Hitler’s Germany but it might as well be. Thankfully, the LCP is being scrapped and to be replaced with a system (yet to be explained by ministers) whereby patients who are at end of their lives are treated as individuals with their own tailored care plan. I could have told them that before the LCP was implemented nationwide by the state health care system (which even those who can go private have to use). This is what socialism looks like in the raw: a killing machine. Today Jeremy Hunt, the current Health Secretary, will address Parliament on the Keogh Report into the 13,000 needless deaths, which are on top of the LCP deaths where it was deemed “legal” to kill. The NHS is not fit for purpose and in many cases doctors and nurses are acting like guards in Auschwitz rather than caring health professionals in the seventh richest country on Earth. We need words from the Health Secretary today explaining what he is going to do about this catastrophe in our hospitals but we also need visual action: nurses and doctors taken from hospitals in handcuffs might be a good start. Categories: NHS, Politics, Uncategorized | Tags: Jeremy Hunt, LCP, Liberal Democrats, Liverpool Care Pathway, NHS, Norman Lamb, Prof Sir Bruce Keogh | Permalink. Let’s stop pussfooting around. Let’s wake up and smell and see the great big elephant in the room: the NHS is not fit for purpose. The Francis Report found 1,200 patients were killed by doctors and nurses at the behest of top-down management targets set from Whitehall. This sentence sounds like something from Stalin’s Russia or Hitler’s Third Reich. But it happened in Staffordshire, England between 2005 and 2009 at Stafford Hospital. And now we find Stafford was not a one-off. Another 13,000 people needlessly died since 2005 at 14 NHS Trusts. The NHS is not a place of care. It is a slaughter house. After the Francis Report was published in February, Prime Minister David Cameron ordered a report into “excess deaths” across the entire NHS. Report author Prof Sir Bruce Keogh investigated the 14 hospital trusts with the worst mortality rates over the past two years. The report will be published on Tuesday. I asked in February how many more have to die before the NHS is broken up and a new form of healthcare, proven abroad, is introduced into one of the richest countries on Earth: the United Kingdom. 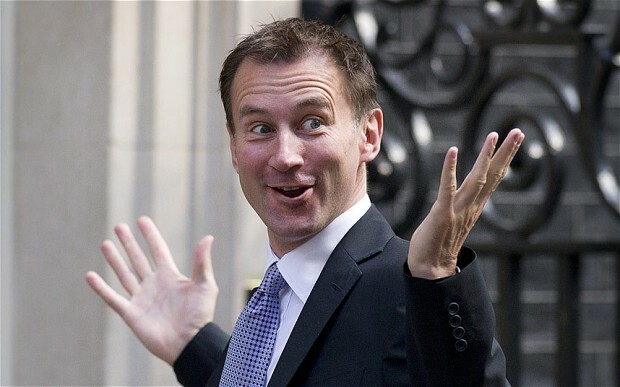 Is 13,000 enough Jeremy Hunt? This crime, and it is a crime which the police are investigating in Stafford (clink, clink doctor! ), has been allowed to happen because of the perverse thinking of the British public, egged on by all political leaders, that the NHS is the envy of the world, the best healthcare system ever invented by man. Well, if the NHS is the best healthcare there is, I dread to think what the worst is. The political party that gave birth to the NHS was Labour and frankly it was them who caused these deaths with their top-down target driven culture imposed on the NHS during the final five years of their reign from 2005 to 2010: from the Secretary of State for Health (Andy Burnham, you have blood on your hands) in Whitehall down through the former Strategic Health Authorities and Trusts into the wards and corridors, which at Stafford Hospital and Basildon and Thurrock University Hospitals resembled killing fields rather than centres of care. Only 51% of doctors and nurses at Basildon and Thurrock said they would be happy for their friends and relatives to be treated at the Essex hospital. David Cameron can wipe the smirk off his Eton face. Nothing will have changed in our hospitals in the first three years of his Coalition Government, mainly because the first thing he did when he became Conservative Party leader in 2005 (as elderly women in hospital were drinking from vases because they were so thirsty) was fall prostrate and pay homage at the sacred altar of the NHS. “NHYes”: remember that. We are promised a statement from the current Health Secretary, Jeremy Hunt, in the House of Commons on Tuesday. Let’s hope this time he does better than his boss, Mr Cameron, who when the Francis Report was published, went out of his way not to criticise the Labour ministers who presided over the slaughter between 2005 and 2009. The Health Secretary at the height of the killing in 2009 was one Mr Andy Burnham, who is now the Shadow Secretary State for Health, and has had the audacity to say the 14 NHS Trusts investigated in Sir Bruce’s report have been allowed to “deteriorate significantly” since the Coalition came to power in 2010. Hold on, what about the thousands of deaths on your watch in 2009 Mr Burnham? I suggest you get your own house in order and legal case before looking to deflect blame elsewhere. Now is the time to point the finger at who is to blame for this catastrophe: the Labour Party, Patricia Hewitt (Health Secretary 2005-2007), Alan Johnson (Health Secretary 2007-2009), Andy Burnham (2009-2010), Sir David Nicholson (Chief Executive of NHS England and Head of Mid-Staffordshire NHS Trust during the slaughter at Stafford Hospital between 2005 and 2009), the doctors and nurses at whose hands the patients needlessly died and all other politicians who say how “wonderful” the NHS is, including Prime Minister David Cameron. The time even for debate about the NHS, which has never been able to take place, shut down by politicians of all sides in case our “wonderful” doctors and nurses are offended by pointing out they are killing patients, has now passed. The NHS is entirely unfit for purpose. We learn today that more soldiers have killed themselves back in the UK than have been killed in total by the Taliban in Afghanistan. The woeful lack of care for our veterans is summed up by reports it is taking a year and a half for a former soldier to see a psychiatrist in the NHS. That’s not a service, that’s an insult to the taxpayer and a system which is killing in our hospitals, on the bridges and the paracetamol poisonings up and down the land. It’s time to bring the killer to book and for the NHS to be broken up with a Netherlands-style healthcare system put in its place. Categories: Politics, Uncategorized | Tags: Alan Johnson, Andy Burnham, Conservatives, David Cameron, Jeremy Hunt, killing field, Labour, NHS, Patricia Hewitt, Prof Sir Bruce Keogh, Robert Francis | Permalink.